My first through was that flying/floating sort of went against the definition of a driving circumnavigation. But I guess that constant contact with the ground is impossible so it seems that the definition is just having propulsion from the wheels. The sea path around Kerbin is pretty clear. Any tips for a sea path around Eve? Just follow the coast? Is the Eve trip only supposed to be land-based? polar? If you only use wheels to propel the vehicle forward, it's a ground-based circumnavigation. The only reason you lose contact with the ground is because of the ground itself. Having said that, my longest jump on Minmus was probably longer than the first flight of the Wright brothers, and they called it flying! Exactly. If you had, Dres would be on the board. Dres was on the leaderboard in the previous challenge. Glad you answered your own question already before you even asked it! So, on my longest stretch around Laythe, I did it at 7.5m/s which used 0.02units/second of liquid fuel. I worked a long time on creating an efficient design and strategy, and this was the best I came up with. If you maintained these figures (and my math is correct), to travel a distance equal to the equatorial circumference of Kerbin at 4x physics warp, it would take nearly 3 (Earth) months and would require 10,000 units of liquid fuel. Of course, efficiency would vary and your sea path would be different than a true equatorial path, but these numbers are daunting. Do you have an ace up your sleeve? From what I have read, the density of the water on Laythe seems to be different than on Kerbin, so that will make a lot of difference. But, what you say is true: the great thing about water travel is that you can move heavy things very efficiently as long as you are not in a hurry. Well, good luck. I'm interested to see the results. I'm no Elcano competitor, but I think you guys are really impressive and come into your threads for inspiration every once in a while. I've been branching into rovers for science gathering lately, and I'm floored by your surmounting of one aspect of this challenge--quicksaving. I have to do it every kilometer or so for my sanity, because I tend to break something about every two. And for every quicksave, you have to arrest surface velocity, so it eats SO much transit time--especially on, say, Minmus, where surface gravity really limits braking ability. I noticed in your challenge rules you mention that quicksaves aren't recommended because they can kraken your rover. HOW on earth do you manage any significant amount of rover travel without judicious use of f5/f9? Am I missing something? How often do you guys F5? How often do you F9? I quicksave routinely. On long runs I have an alarm set to go every ten minutes. 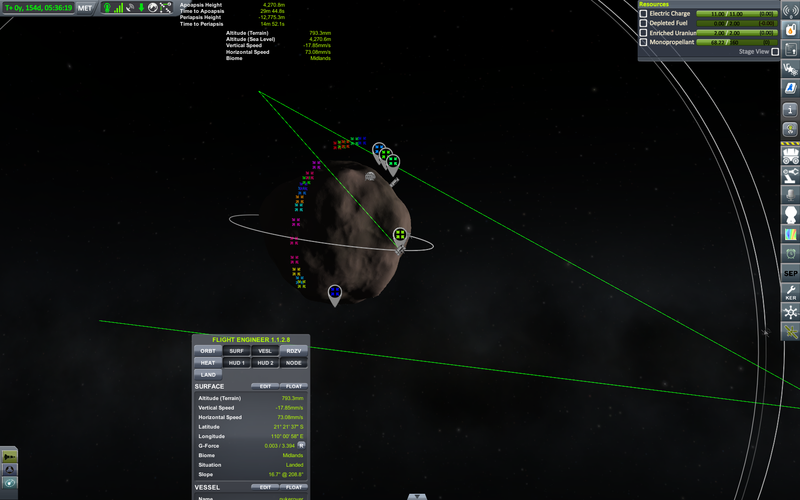 I quickload only in the event of hitting a KSP bug (crash, horrible terrain seam, etc). Driving errors are not (in my view; this is not a challenge rule) allowed to be quickloaded away. Every 10 minutes... I don't know if I've ever had ten minutes of healthy roving on Minmus or the Mun. Can someone direct me to a good thread about roving technique so I can stop hijacking the Elcano thread? I hardly think it's hijacking. 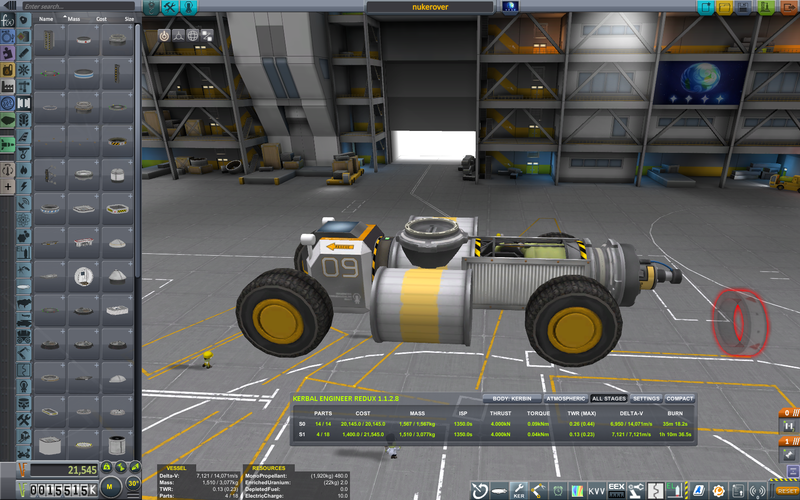 I don't think the key is roving technique, but design - a low wide rover is hard to roll and stable on most surfaces, and you can then use reaction wheels (and MechJeb's Rover Stability Control) to keep on an even keel. Also include some RCS. It'll let you keep your rover pinned to the ground on moons like minimus, which help with bouncing/jumping off of hills and crashing. I have to say, I never bothered with that on Minmus. I _did_ fit a nose engine, which helped with one or two of the "drove off a really colossal cliff in the dark" issues. Minmus and Mun in 1 trip. The mun is so much larger than I had previously thought. 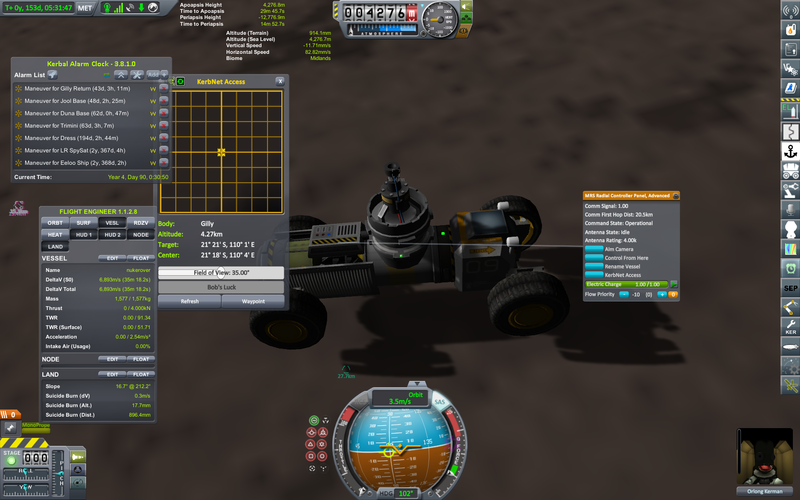 I ended up driving my rover backwards for the mun trip because the liquid fueled engine worked great as an emergency brake, even though that left me with the land I'd covered more well lighted than the land in front of me. The trip was feeling quite tedious when I met the canyons and was rejuvenated. Having completed this relatively long land circuit has made me realize that the point of this whole thing is to become more intimately acquainted with these bodies. I had been on the mun dozens of times and never been in the canyons. I used my Intro to Photoshop skills to make this. Enjoy. Minmus and Mun in one trip. Mun is a good size, I think. Big enough to feel like a solid achievement, but not quite so much slog as Kerbin. The strategy I figured out is to F5 when you are midair on a long jump. 1) Make sure it is a jump you can land. Tips below. 2) Stop and do a traditional "ESC" -> "Save Game" every once in a while because if you F5 too low to the ground the reload will be an instant-splosion. 1. RCS is critical. Spread it out on your rover. Heavy on bow and stern, heavy on sides...so heavy all around. This also means lots of monopro on board. You'll need to turn it on and off a lot so you can control the wheels when you're safely on the ground to avoid wasting the monopro. 2. Long-ish body, wide too, but longer than wide. You prefer to roll 60° right or left, go up on the wheels and save it with Q or E rather than rolling forward with a crunchy tumbling. 3. Wheels to the corners. Try to make it so that the wheels are the first thing that contact the oncoming incline. 4. Set SAS to prograde (unless you decide your rover works better in reverse after you arrive-it happens to the best of us). This lets the RCS do its thing well, especially during the bounce. 5. Try to land on a downhill with your front wheels landing slightly before the rears. If you have the SAS on prograde, you may need to lift the nose up a little right before you touch. Be ready with Q and E to keep the rubber side down. And (as most of us know well, but not obvious to a rookie) bind the rover movement commands separately to rotation. By default they're both on WASD which is about as useful as a chocolate fireguard. Location: The land of lost socks. Check out the Dakar 2017 challenge. I have learned so much about building rovers in a month and what a fun way to do it. One of the things I really like to do in KSP is build boats and ships. One of these days I'm going to launch one to Laythe and do that challenge. There we go. Gilly Circumnavigation complete.